Wolverine will be like a wandering samurai in his new movie. 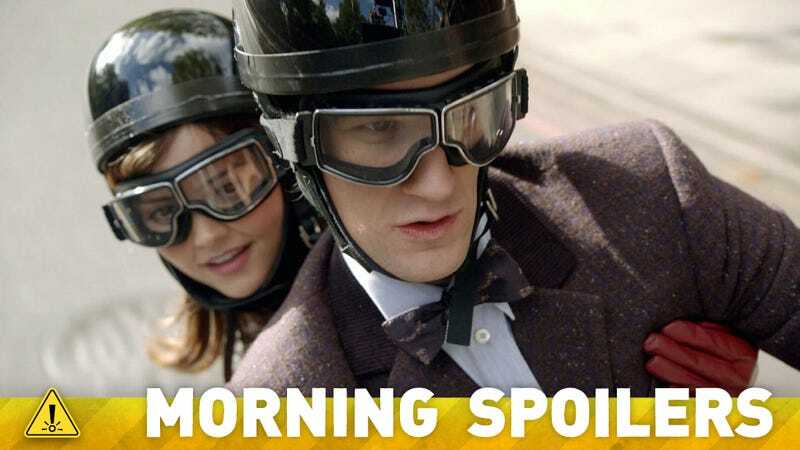 Plus More On Doctor Who And Game of Thrones! Transformers 4 has a new plot description. The Evil Dead reboot refuses to apologize for itself, according to one of its stars. Jurassic Park 4 is updating the franchise's dinosaur biology. Check out a video from the set of Godzilla. Ryan Reynolds explains the holdup on the Deadpool movie. Plus Revolution hints and a new regular cast member for Arrow! Spoilers from here on out! "In terms of Japanese lore, the idea of the ronin - the samurai without purpose, without a master - seemed to me to be the perfect metaphor for who exactly Wolverine is when you come upon him in this movie. Kind of a hero without a reason for being a hero, who's lost his desire to protect, or even know what he's supposed to be protecting." "Viper doesn't really have many people that she cares about, most of them she just uses for her own purpose." "My character's very physical. Yukio and Wolverine have a lot in common. She really takes care of him and he also cares about her." "It's up to the studio. The studio I think is reluctant to pull the trigger on such a hard Rated-R script. Then the guys who wrote it and the producers won't make it unless it's that hard and, you know, raunchy." As humanity picks up the pieces, following the conclusion of Transformers: Dark of the Moon, Autobots and Decepticons have all but vanished from the face of the planet. However, a group of powerful, ingenious businessmen and scientists attempt to learn from past Transformer incursions and push the boundaries of technology beyond what they can control – all while an ancient, powerful Transformer menace sets Earth in his crosshairs. The epic adventure and battle between good and evil, freedom and enslavement ensues. I love that this movie doesn't apologize for itself at all. It's just exactly what people want, and you know sometimes they do get a little weird about what kind of vibes you're putting out into the world, but I don't think that… I don't know, this is just personal, but I don't think we're making the world a worse place by having this movie out. It's disgusting, but it's real life. It actually kind of homes you in on your limbs being a part of you, your body being a thing that can be maimed or disfigured for life, what that would feel like if you were in that situation where thing were just being take off of you and being stabbed, or you're losing your life. It's very, very real. It kind of roots you in your body. It makes you go, Life is scary. Life can be scary. I think it would have been hard to dislike this character as the audience. I don't think I could have played it where you disliked him personally. In playing it sincerely, you become that character. Eric is the audience. He is the audience. Because he's the one who knows more than anybody else. He knows what's happening. He's reacting like the audience is reacting, like what?! What are you talking about? We have to do this. And the audience is just like, yeah. So they're behind him. In some ways, he really… A lot of these characters were the main character for parts of the film. Because Jane doesn't seem like the main character for most of film, but at the end, you're on her side. So you're really just on everybody's side in this movie. I think the audience was super behind him just from the beginning to the end. Maybe at the super beginning, yeah, he's a little bit of a passive aggressive douchebag to Shiloh's character, like you got to start somewhere and it gave, it made some… We had something to work with from there. We had some kind of feeling to be playing with. "We are very excited about the franchise, we look forward to announcing a director soon. We are currently developing the screenplay and working with our partners. We look forward to developing the script soon and signing a director. We are hoping within the next 3 years it will be released." "He gets his sword in his hands. But the thing with Robb is he never wants to kill... He's got all sorts of plans in place in order to actually win his war, but he's running on empty at the moment. He doesn't know where his brothers or sisters are, or if they're still alive. He's constantly chasing the Lannisters and they're constantly running from him. His own men are kind of revolting. So they're exhausted, they're starving and he's at the end of his tether." We need to make room. It's a huge cast and sometimes you just need to clear some people out of the way. It's a culling. There are too many deer in the forest. No. Obviously, we love George's books, in many ways, more than any books we've ever read, otherwise we wouldn't have devoted every waking and most sleeping moments of our lives to them. In the process of adapting, as complex as the show is allowed to be, compared to a feature film or a normal television show, 10 hours seems like a lot, but when you have a world like the one that George has built, you start to realize how quickly that story real estate gets taken up. There have been places where we did just have to clear out space to make room for all these guys who we love so much and are so invested in, to do them justice. If there are too many balls in the air, at a certain point, you reach the limit of what an audience can really keep in their head at once and remain invested with at once. It's a juggling act to get right up to that line of maximum complexity, but not go over it and start to lose people. Well, I'm writing book 6, The Winds of Winter. I'm starting to worry because everybody keeps asking me, "What are you going to do, if David and Dan and the show catches up to you?," and I didn't think it was a problem before, but they're moving faster than I am and it's beginning to scare me. I have not failed to notice this. I feel sometimes as if I'm laying track for a railroad and I can hear the locomotive coming up behind me. It's building speed and I see the smoke and I hear the whistle coming, and I better keep laying that track pretty fast ‘cause I'll get squashed, if the locomotive comes. But, I still have a pretty considerable lead, or at least that's what I'm telling myself. Season 3 is only the first half of book 3. Season 4 will be the second half of book 3. And then, I have book 4 and book 5, and those are gigantic books which have to be recombined because they're actually parallel. I'm hoping those will be at least two seasons, maybe three. That will give me some time to finish book 6. By the time they're doing that season, I'll be writing book 7. That's my story, and I'm sticking to it.